Machiavelli drew on 2000 years of history to develop theories on how to make war, how to win battles, and how to gain power and keep it. Using Machiavelli as a springboard, Dennis and Ching Ping Bloodworth boldly and adroitly map out 3000 years of Chinese political-military history--from Confucius to Mao Zedong--using Machiavell's discourse of power politics. They reveal a pageantry of Chinese historical figures, from wise strategists, heroic generals, crafty statesmen, and ruthless emperors to brave knights-errant, and from stately Confucian philosophers to shrewd, cunning Legalist thinkers, without the usual Confucian restraint.The Chinese Machiavelli intends to help Western readers, who may be puzzled by Chinese diplomatic and military strategy, understand the principles that have guided both past and present Chinese leaders. For instance, why have modern communist Chinese leaders often befriended right-wing European politicians who are out of office rather than left-wing leaders in power? Why did they entertain President Nixon while the United States was at war with North Vietnam? Within the framework of a chronological history concentrating on power politics and using the social and cultural scene as a backdrop, the Bloodworths use China's long history to find answers.Peter Li's preface for this new edition explains the structure of the book and offers a penetrating analysis of the authors' style and method. 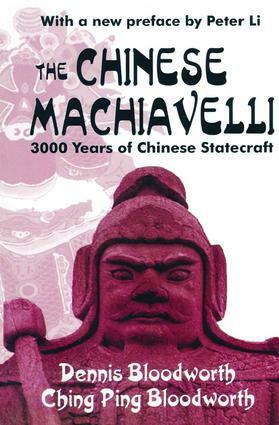 Although The Chinese Machiavelli is authored for the general public rather than for the specialist, the latter will also benefit from reading this history. The authors describe the continuity of Chinese history and reveal how knowledge of China's past sheds light on the political behavior of China's rulers today.